When people think of the month of February, they typically think of 2 things. Generally, they think about the fact that it is the shortest month of the year, but most of all they think of Valentine’s, love and their significant others. These thoughts of love are further fueled by the plethora of heart-shaped decorations, chocolate and jewelry that adorn stores and advertisements. Because everyone is already thinking about hearts, the American Heart Association(AHA) came up with the idea that February should also serve as National American Heart Month. Due to their persistence, it was officially proclaimed a nationally recognized month on December 30, 1963 by President Lyndon B. Johnson, and a mere 33 days later, the first official American Heart Month took place in February 1964. Since then, the AHA has worked tirelessly to increase awareness of the dangers of heart diseases and the steps people can take to avoid it. The statistics regarding heart disease in the United States alone are astounding. According to the Heart Foundation, this disease is the leading cause of death in the United States and claims more lives than all forms of cancer combined. In the US, someone suffers from a heart attack every 34 seconds, and every 60 seconds someone dies from a heart-related illness. This adds up to approximately 525,000 deaths each year. In fact, in 2011 heart disease killed nearly 787,000 people. As with any death-causing disease, the statistics are staggering and sad. Fortunately, there are many precautions and life-changes one can make to decrease their risk of suffering from heart disease. 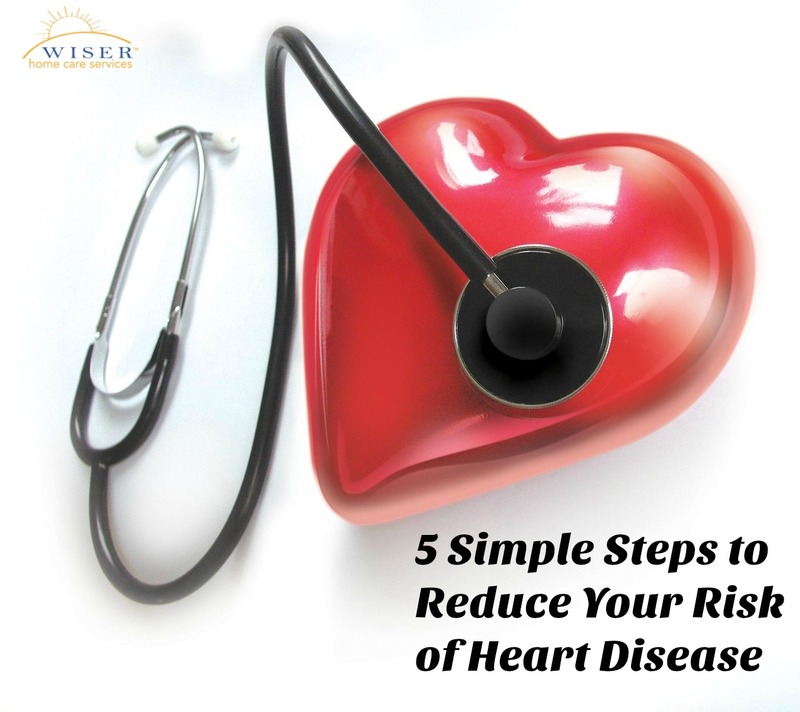 Keep reading this week’s blog to find out how you can help reduce you and your loved one’s risk of heart disease in five simple steps. Ok, don’t literally do that, but do eat foods with an emphasis on heart health. Heart healthy foods include: fruits, veggies, whole grains, beans, nuts, fish, lean poultry and meat. You will also want to limit salt and sugar intake. One of the first things you should do is schedule a checkup with your doctor. Your doctor will screen you for any pre-existing conditions, tell you what you are at risk of and give you targeted ways you can reduce your risk of heart disease. This is also a good time to consult with your doctor about starting an exercise routine. Before you leave, you will want to make regular follow-up appointments to make sure you stay on track. It’s no secret, smoking and drinking is horrible for your health, but we know giving it up is easier said than done. Taking small steps to reduce the amount you smoke or drink will significantly help in reducing your risk of heart disease. The sooner the better. Getting the appropriate amount of sleep is an important aspect in reducing your risk of heart disease. We mean this one literally. A good way to increase your heart health is to maintain an active lifestyle. Professionals recommend at least 30 minutes a day, 5 days a week of moderate exercise. This means any activity that gets you moving and sweating a little. Stress is the fuel that feeds the heart disease fire. The more stress you have, the more strain you put on your heart and overall health. Fortunately, there are many things you can do to reduce stress in your life such as yoga, breathing exercises and time management techniques. Reducing you and your loved one’s risk of heart disease, or managing heart disease itself can be tricky and stressful. As always, Wiser Home Care is here to help you with whatever you need. From providing care to developing an extensive care plan for your loved one, and everything in between, we are happy to help. Please contact us, and we will be happy to answer any questions you may have.